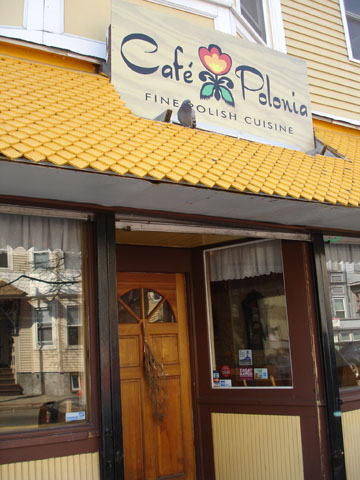 Café Polonia is a Polish restaurant in South Boston. The decor both inside and out strikes a nice balance between quaint and fancy, and the food is delicious, if a bit heavy. If you’re getting off the T at the Andrew Sq stop you better either live there or need something in that area really REALLY bad. We needed blood sausage really REALLY bad and so will you hopefully after reading this weeks post! A short walk from the station itself Ché and I found Café Polonia looking rather inviting. It stands out from the rest of what could be considered drab everyday neighborhood with it’s bright yellow awning and a sign boasting “FINE POLISH CUISINE”. Inside we discovered a cozy atmosphere with unique and comfy seating arrangements. In the center of the restaurant is a cute two person table which sits under what I can only describe as your own personal Polish pagoda (pardon the alliteration…). The walls were also decorated with some great antique-y Polish artifacts that really bring everything together. It’s like being in an Applebee’s but less annoying and more interesting. We were greeted by the friendly waitress who was really quick and attentive with everything we ordered. 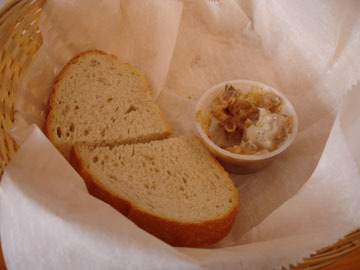 First out was the bread and “butter”. This butter mind you is what, for lack of a better name, I’ll call Polish butter. After tasting it and identifying that it wasn’t butter Che and I were intrigued to the point that we had to to figure out what we had just hastily ingested. Asking the waitress she quickly replied that it was a concoction made up of pork lard, bacon bits (not bac’n bitz for those counting), garlic, and secret Polish spices. YUM! While it wasn’t much to look at, in fact it’s probably better that you don’t look at it, it was actually rather tasty, and like most things it probably won’t kill you in moderation. It was salty and a bit crunchy. Mostly it tasted like a bacon flavored bread spread. Best invention ever? Quite possibly! After Wilbur’s lipo leavings we got into the thick of it and ordered the blood sausage or kiszka (kish-ka) as it was on the menu. Before getting to that another thing to mention was that the menu was both in English and Polish which I thought was pretty cool! Back to the kiszka! It came out and to our surprise it wasn’t in sausage form at all, but rather a steaming reddish brown mound on a plate garnished with pickles and caramelized onions. They pile a pretty good helping of it onto a little plate too. Gee what if we didn’t like it? It’s a good thing we did. Tasting it we almost both came to the conclusion that they probably cook everything there in lard. It had a rich meaty flavor soaked into the grain from the blood and for me at least it ended up having a familiar flavor. Believe it or not, but it reminded me a lot of a good Philly cheese steak. Call me crazy but it had the taste of a well marbled piece of beef. The onions they cooked it with is what I think keyed me into the Philly flavor. It has a unique texture like corned beef hash meets rice pudding. While that combo might sound gross keep in mind I’m talking texture not flavor. I’m always psyched for new and interesting textures. 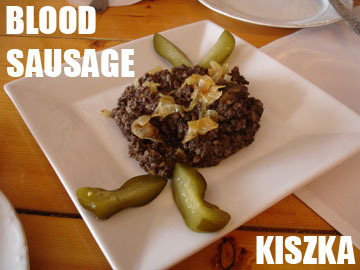 I also came to the conclusion that blood sausage must be the Polish equivalent of great comfort food. Paring it with the pickles just seemed right. The sausage was soo rich it left a strong flavor in your mouth so the pickles served to cleanse the pallet. Although the pickles also had a strong taste they were quite delicious. If you count yourself a pickle aficionado it might be worthwhile checking it out just for them. We should have maybe stopped there but all the food on the menu sounded great, and I’m sure there isn’t a single thing on the menu that’s not. Both Che and I ordered variations on their potato pancakes. 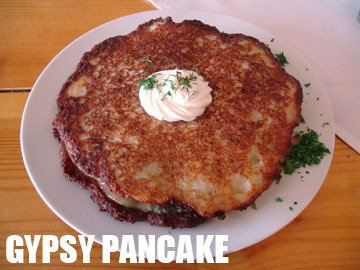 I got what they called a Gypsy Pancake. It would be two giant pancakes the size of my head with a heaping helping of hungarian beef goulash in between them (sorry alliteration again…). It was pretty much what I’d call Polish shepherds pie. The pancakes themselves were perfectly brown and crispy on the outside with fluffy white mashed potato on the inside. It was a lot like a giant home fry or french fry. 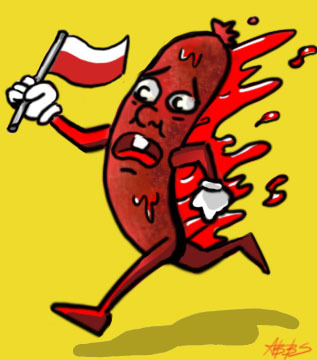 A Polish Fry, if you will. Again most likely cooked in lard. The goulash beef was so tender it fell apart in my mouth and was served in rich dark brown gravy with vegetables and mushrooms in it. I love mushrooms so I was also psyched for their sudden and unexpected appearance. I live with a lot of people who don’t really like mushrooms so I haven’t had them in quite a while. Seeing them was a lot like bumping into an old friend. A tiny gray friend covered in gravy who doesn’t mind being devoured. What a good sport! All in all I didn’t know what to expect going into this week, but I was pleasantly surprised with the experience and would go again, and also urge anyone interested in authentic Polish food to give it a try. Also located across and down the street a little ways is a european deli where they have all the meat and produce they use in the cafe. Ché and I went to check it out afterwards and accidentally ended up buying a giant lump of blood sausage, but that’s a story for another time. So even if you just wanna try to cook it yourself or you just want the pickles they’ve got everything you need at pretty decent prices. Oil codependence is only one of the many ways that the United States stands united with the Arab world. Blood brings these two regions together; they are the only places in the world where it’s not widely eaten. For Muslim countries, it is avoided because of dietary restrictions. The Koran forbids the consumption of blood. In the United States, the reason is not as clear cut. Our closest cultural relative, the United Kingdom, has a long standing tradition of the blood based black pudding. However, unlike innards and ground beef, blood sausage has a notoriously short shelf-life. The same British report says that 24% of the black pudding had unacceptable grades of microbial activity. While packaged blood sausage is now available in the rest of the world, in the days when industrial taste makers where standardizing food to sell throughout United States, the unreliable nature of blood pudding meant its necessary ingredient was literally left on the killing floor. Currently, blood is thought of by the meat industry and the USDA as less of a food and more of a valuable byproduct, used in medicine and as a leather stiffener. In the old days, like hamburger meat, blood sausage was not mass produced, but made locally by small, privately owned butcher shops, like the one that Andrew and I visited after our meal. Of course, the majority of Americans now shop at franchised super markets, where most of the meat is prepackaged, and much of the artistry of butchering has been lost. In this way, the lack of blood sausage in the United States represents not only the loss something that can be eaten, but the loss of a livelihood, a way to eat. The food and service were great, and the atmosphere was inviting. The chicken was so tender it almost disintegrated when it hit the tongue, and the tripe, beef hearts, and gizzards were all perfectly marinated and tasty. Innards make most people in America squeamish, more likely to remind of a horror movie than of dinner. To be honest, after this most recent meal, the idea of my stomach digesting something else’s stomach did seem, if not gross, then a little funny. We do eat innards, but usually when they wear a marketing disguise, like “natural casing,” or as part of regional cuisine, as in the case of chitlins. The specific organs of this meal, tripe, gizzards, and heart, occupy an unusual place for organs in industrialized meat. Many organs have uses beyond eating, as described by the USDA in the Industrial Uses of Agricultural Materials Situation and Outlook Report. Stomach, heart, and gizzards never get mentioned, which makes sense because they are specialized muscles, producing no hormones. As such, they most likely end up as part of pet food. Why does America feed its pets food that humans could eat, on top of already feeding equally edible grain to cows instead of grazing them? One reason behind the decision is the “interchangeable sameness” (to cop a phrase from Frankfurt School stalwart Theodor Adorno) of modern American cuisine as described in Eric Schlosser’s book Fast Food Nation. Schlosser notes “The key to a successful franchise, according to many texts on the subject, can be expressed in one word, ‘uniformity.’” In describing the business processes of McDonalds and other fast food franchises, this term, “uniformity,” occurs again and again. While he does describe the uniformity of the product, he neglects the “interchangeable sameness” of the animal’s very conception. Beef gets sold as hamburger, chicken as nuggets, and fish as fried patties. All of these foods focus the idea of each animal to an artificial vital essence, impossible to divide further. Tripe, gizzards, and heart, with their unique textures and flavors, conflict with the play dough nature of such processed foods, and so they cannot be part of what Schlosser describes as “the all American meal.” They may even be there in trace amounts, but if they are, they have been absorbed into the bio-mass of the patty or nugget, too small to ever recognize. Well…sort of. The YUM Card is a great way to save money at restaurants and support the Somerville community. The YUM card gives a 10% discount to any meal over $25 at participating restaurants in Somerville, such as Machu Picchu. They are also extremely affordable, costing only $12. 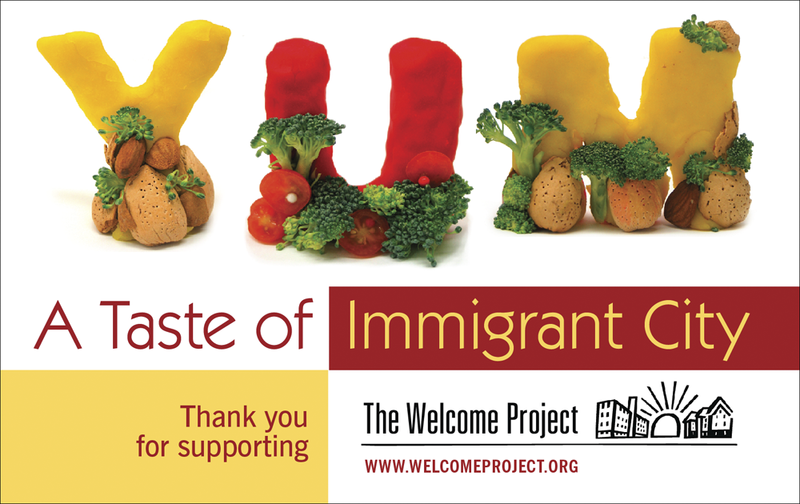 All proceeds go to support the immigrant advocacy group, The Welcome Project. Frog’s legs are tasty, nutritious, and are eaten by most of the world’s population. Why are they not popular in the United States? Is it as simple as the old wives’ tale that frogs produce warts. (Then again, what if you kissed a frog’s leg, and it turned into a tiny prince’s leg? Well, that would probably be just as stigmatized. Anyway, back to the post.) Much of the reason probably has to do with America’s idea of meat. Meat is a cow, a pig, or some other farm yard mammal or bird. It is not something that you have to actually go out into the wild and hunt with a flashlight. This runs counter to how Americans have eaten for the last hundred years. In his book Hungering for America, Hasia R. Diner explains “American workers [and] transplanted Europeans…ate precisely those items which in Europe were defined as luxuries, foods reserved for the upper classes, with meat and white flour bread high on the list.” In the old country, a person hunted the easily accessible meat that was available. In the United States, it came to you. The idea of hunting frogs also does not fit into the Hemingway aesthetic in the same way that cattle ranching, fishing, or big-game hunting. Everyone remembers the great buffalo hunt, but nobody romanticizes Mr. Toad’s Wild Ride. On top of this, after dissecting frog’s in high school, few students would want to eat them. Surely, there are contemporary issues with eating frog’s legs, and these issues become apparent in the rest of the world. Ecological destruction and human poverty have begun to trouble frogs worldwide. In the Dominican Republic, people who must supplement their diet with frogs, as well as a deadly frog fungus, threaten the lives of the ‘mountain chicken’ a native frog species. This fungus also affects just about every amphibian except the American bull frog, which means that frog farming leads to devastation of local populations. Of course, throughout Asia and South and Central America, frog farming is a valuable cottage industry that many rural farmers use to supplement their income. This makes calls for boycotts from Americans and Europeans sometimes literally difficult to swallow. Their efforts would probably be better spent supporting programs that would empower frog farmers and hunters to find more sustainable ways to feed themselves and make a living. With all of this in mind, we wanted try frog for ourselves. Anh Hong in Dorchester serves, among the rest of their very tasty menu, curried frogs’ legs. We dove headfirst into our smoothies. Ché ordered a Durian smoothie, a preview, of a later post, which will be significantly more difficult than this one, something we knew when we could smell it though the straw. The frogs’ legs themselves were a pleasant surprise, if fairly neutral. Almost flavorless, they taste like chicken only because they’re fairly bland. They also have little hints of fish. The texture is almost like left-over fried chicken, sans the skin. The curry sauce that it was cooked in however, was pretty good, if it did not penetrate into the frog meat. 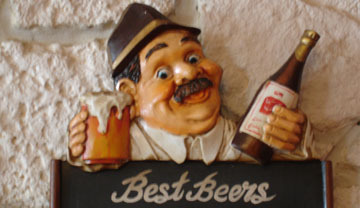 In general, we can recommend the restaurant itself much more than frog meat. The shrimp noodles and the squid, which we also ordered, were much better. Walking into any kind of Asian restaurant and being the only non Asians is always a good sign cause you know that probably means the foods going to be great. Walking into a Vietnamese restaurant and seeing a Chinese new year tree sitting in the middle of the room kind of confuses you. I was there for the food not necessarily the atmosphere although it was comfy place to enjoy an interesting meal. Sadly my camera’s batteries were dead so we weren’t able to get pictorial evidence of our journey into flavor country, but I’m hoping my accompanying illustrations convey our experience. First up was our round of “smoothies”. More like milkshakes really. They taste mostly of whatever flavor we ordered blended with vanilla ice cream. Though at $2.50 a pop they were definitely the perfect combo of tasty and affordable. They had a decent array of smoothie ingredients you might not be familiar with including the three we got: avocado, durian, and jackfruit. I got the avocado smoothie and it was delicious. It had a very smooth texture and the flavor of the avocado really comes thru and doesn’t get lost in all the ice-cream. Plus it had this awesome neon green color to it too like a shamrock shake at McDonald’s except a lot tastier. We chose this joint cause we were sure they had frogs legs on the menu the odd smoothies were just a bonus find. They had the legs them served in two different ways. One dish was served with the legs and lemon grass, but we got the curried frogs legs. The dish was served over thin yellow noodles with an assortment of vegetables and crushed peanuts over top. All these elements worked together to create a really unique flavor. The frog itself as many people report tastes a lot like chicken. A fishy chicken, but chicken nonetheless. It’s bland like chicken but flaky like the consistency of fish, and the skin provides an interesting texture. It’s not crunchy or slimy like some might think, but it gives the curry something to cling to. It wasn’t the first time I’ve had frog, but it was so long ago that I didn’t remember it that well, and was excited to finally get the chance to try it again. It was a lot better than I remember, and was very pleased with the entire meal. I didn’t get sick or anything so that’s good too. I definitely recommend it for anyone who’s looking to try something new to give it a shot. On a side note next week starting March 14th to the 19th is Restaurant Week in Boston and again from March 21st to the 26th so you can go to: http://www.bostonusa.com/visit/restaurantweek/restaurant-week/alphabetical-list-of-restaurants/1191 to check out a list or participating restaurants and scheduled events.